Night Attack on the Sanjo Palace from the Illustrated Scrolls of the Events of the Heiji Era. The Heiji disturbance, which occurred late in 1159, represents a brief armed skirmish in the capital. One faction, led by Fujiwara Nobuyori, in alliance with the warrior Minamoto Yoshitomo, staged a coup. In the scene depicted here, they surrounded the palace, captured the sovereign, placed him in a cart and then consigned the structure to the flames. Even though Nobuyori and Yoshitomo were triumphant here, they later suffered defeat and death at the hands of their rival Kiyomori. After the Heiji disturbance, Taira Kiyomori gained influence as a trusted advisor to the retired emperor, Go-Shirakawa. He launched his own coup some twenty years later, which unleashed a civil war, known commonly as the Genpei Wars (1180-85). One of Yoshitomo’s sons, Minamoto Yoritomo, triumphed in this campaign, and consigned Taira Kiyomori’s relatives to death or exile. Yoritomo established the Kamakura bakufu, which provided judicial and policing authority for its followers, known as housemen (gokenin) from 1185 until 1333. The Heiji scrolls date from the thirteenth century and represent a masterpiece of “Yamato” style painting. They can be documented as being treasured artifacts in the fifteenth century, when nobles mention viewing them, but they now only survive in fragmentary form. The scene appearing here, entitled “A Night Attack on the Sanjo Palace” is the property of the Boston Museum of Fine Arts and provides a rare and valuable depiction of Japanese armor as it was worn during the early Kamakura era (1185-1333). By contrast, most surviving picture scrolls showing warriors date from the fourteenth century and show later styles of armor. “A Night Attack on the Sanjo Palace” provides an excellent introduction to the genre of picture scrolls. The scrolls read from right to left, and all action flows to the left. A few people hurrying flow into a confused throng of warriors and nobles, epitomized by a wayward bystander being crushed by an ox cart. Out of the confusion, attention shifts to the palace, where Fujiwara Nobuyori can be seen ordering the retired emperor into the cart. Wisps of smoke appear, leading to a conflagration at the palace, with hapless supporters of the Taira being killed, and women of the palace attempting, with mixed success, to flee. 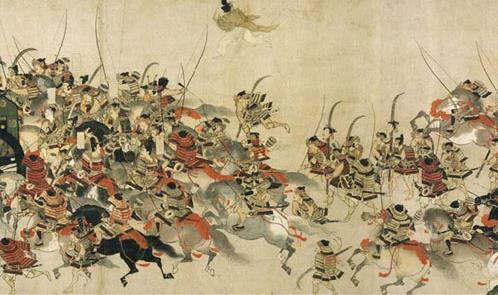 Gradually order is restored, and a band of warriors, including Fujiwara Nobuyori and his co-conspirator, Minamoto Yoshitomo, surround Go-Shirakawa’s cart in a triumphant procession. Credit: Museum of Fine Arts, Boston. Previous Post 360 year old inn closes its doors.